This riddle has long troubled parents, teachers, and scholars: learning language sometimes seems ridiculously easy and sometimes impossibly hard. And the easy times are outside school, the hard times in school. Virtually all human babies learn to speak their home language remarkably well in a very short time, without any formal teaching. But when they go to school, many appear to have difficulty, particularly with written language, even though they are instructed by diligent teachers using expensive and carefully developed materials. We are beginning to work out this seeming paradox. Careful observation is helping us to understand better what makes language easy or hard to learn. Many school traditions seem to have actually hindered language development. In our zeal to make it easy, we’ve made it hard. How? Primarily by breaking whole (natural) language up into bite-size, but abstract little pieces. It seemed so logical to think that little children could best learn simple little things. We took apart the language and turned it into words, syllables, and isolated sounds. Unfortunately, we also postponed its natural purpose — the communication of meaning — and turned it into a set of abstractions, unrelated to the needs and experiences of the children we sought to help. In homes, children learn oral language without having it broken into simple little bits and pieces. They are amazingly good at learning language when they need it to express themselves and understand others, as long as they are surrounded by people who are using language meaningfully and purposefully. This is what many teachers are learning again from children: keep language whole and involve children in using it functionally and purposefully to meet their own needs. That simple, very basic discovery is leading to some dramatic, exciting changes in schools. Put aside the carefully sequenced basal readers, spelling programs, and handwriting kits. Let the readiness materials, the workbooks, and the ditto masters gather dust on the shelves — or better yet, donate them to community paper drives. Instead, invite pupils to use language. Get them to talk about things they need to understand. Show them it’s all right to ask questions and listen to the answers, and then to react or ask more questions. Suggest that they write about what happens to them, so they can come to grips with their experiences and share them with others. Encourage them to read for information, to cope with the print that surrounds them everywhere, to enjoy a good story. This way, teachers can work with children in the natural direction of their growth. Language learning then becomes as easy in school as out. And it’s more interesting, more stimulating, and more fun for the kids and their teachers. What happens in school supports and expands what happens outside of school. 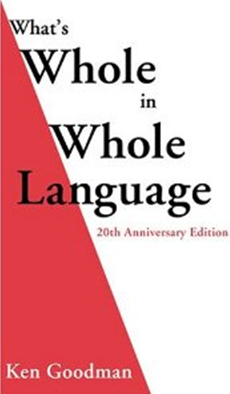 Whole language programs get it all together: the language, the culture, the community, the learner, and the teacher. What makes language very easy or very hard to learn? It belongs to the learner. It’s part of a real event. It has purpose for the learner. The learner chooses to use it. It’s accessible to the learner. The learner has power to use it. It’s broken into bits and pieces. It’s irrelevant to the learner. It belongs to somebody else. It has no social value. It has no discernible purpose. It’s imposed by someone else. These lists show that a whole language program is more pleasant and more fun for both pupils and teachers. Is it also more effective? Yes, it is. With the language they’ve already learned, children bring to school their natural tendency to want to make sense of the world. When schools break language into bits and pieces, sense becomes nonsense, and its always hard for kids to make sense out of nonsense Each abstract bit and piece that is learned is soon forgotten as kids go on to further fractured fragments In the end, they begin to think of school as a place where nothing ever seems to make sense. That’s why learning language in the real world is easy, and learning language in school should be easy, but is often hard. What makes language learning hard? Moving from small to large units has an element of adult logic: wholes are composed of parts; learn the parts and you’ve learned the whole. But the psychology of learning teaches us that we learn from the whole to parts. That’s why whole language teachers only deal with language parts—letters, sounds, phrases, sentences — in the context of whole real language. Many so-called “skills” were arbitrarily chosen. Whatever research they’re based on was done with rats and pigeons — or with children who were treated in the research like rats and pigeons. Rats are not kids; rats don’t develop language or think human thoughts. Artificial skill sequences turn schools into mazes for children to stumble through. When the purpose of instruction is to teach language for its own sake, or to make kids discuss language like linguists, then the learner is distracted from what he or she is trying to say or understand through language. Uninteresting, irrelevant exercises are particularly tough on minority children who are constantly being reminded of the distance between their world and the school world. It’s hard to motivate kids when the stuff they are asked to read and write, hear and say, has no relation to who they are, what they think, and what they do. What makes language learning easy? Language should be whole, meaningful, and relevant to the learners. Pupils should use language for their own purposes. Outside school, language functions because users want to say or understand something. In whole language classrooms, the kids own their own language and teachers respect this ownership. Pupils should learn through language while they learn language. Language is learned best when the focus is not on the language but on the meaning being communicated. We learn through language at the same time that we’re developing language. We don’t learn to read by reading; we learn to read by reading signs, packages, stories, magazines, newspapers, TV guides, billboards. Schools should build on the language development children have attained before they start school, and on the experiences they have outside school. Whole language programs respect the learners: who they are, where they come from, how they talk, what they read, and what experiences they already had before coming to school. That way there are no disadvantaged children as far as the school is concerned. There are only children who have unique backgrounds of language and experience, who have learned to learn from their own experiences, and who will continue to do so if schools recognize who and where they are. School programs should be seen as part of the empowerment of children. Schools must face the bitter fact that children tend to become literate and succeed in school in proportion to the amount of power to use their literacy they and their families possess. Helping pupils become literate will not in itself give them power if society denies them power. But helping them to achieve a sense of control and ownership over their own use of language and learning in school, over their own reading, writing, speaking, listening, and thinking, will help to give them a sense of their potential power. Schools with effective whole language programs can help children to achieve power; they can provide real access to personally and socially useful knowledge through development of thought and language.